The board of DCA met tonight. This was a very interesting meeting during which we looked at plans for next year. The last year, the DCA's 10th anniversary, was an excellent year for the organisation and I am looking forward to the next year. I think that there are many exciting exhibitions on the way. To find out more about the DCA visit the website. The DCA is a major achievement for Dundee over the last ten years and is a monument to the achievements of the previous Labour-led administrations of the City Council. I attended the monthly meeting of the board of Dundee Ice Arena today. The Ice Arena is an excellent facilities and I would urge anyone to visit the arena. 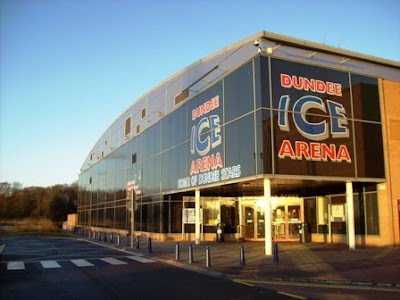 More information on Dundee Ice Arena can be found on the ice arena's website. I attended the launch of Faith in Community Dundee at the Mark Henderson Centre. This project brings together people from a variety of faiths. The project recognises that churches and other faith communities often work to promote the regeneration of areas and to combat poverty. I was hugely impressed with the work which was set out today and I wish this project all the very best for the future. You can find out more about the work of Faith in Community Scotland by visiting their website. This is an interesting idea and I think it is worth developing more. I also attended a meeting of Dundee City Disability Sport this evening. There was a discussion about the need for a new adapted mini-bus for the organisation. Please visit the website, if you could help with sponsorship of a mini-bus please contact the secretary. Providing sporting opportunities for everyone in the community is important and DCDS does go some way to achieving this goal. There was a board meeting of Dundee Leisure this evening. Please take the time to visit Dundee Leisure's website. This was a useful meeting about this important area of work. Dundee Leisure is preparing to open the new facilities at Grove Academy in Broughty Ferry to the public in the near future. This afternoon I briefly attended an open day at Millview Cottage this is a new facility designed to provide a home for looked after children. I was very impressed by what I saw today, I would like to wish the young people and the staff all the very best in their new home. A number of the City Council's committees held their meeting on Monday evening. The agenda can be found here. There were a number of interesting reports brought forward. On Monday I attended a very interesting site visit with officers from the City Council, the police and my ward colleague Cllr Fraser Macpherson to look at some of the issues around parking problems associated with some of the shops on the Perth Road. A number of constituents have raised concerns with me and I hope that some useful proposals might come forward as a result of this meeting. On Friday evening I attended the Sports Development Dance festival in the Caird Hall. This event was organised by the City Council's Leisure and Communities Department's Sports Development section. I was there because I knew one of the dancers but I was hugely impressed by the whole event. There are so many young people enjoying themselves and demonstrating that physical activity can be great fun. The Funky Feet and Urban Moves programmes are popular and on this evidence are excellent programmes. Well done to everyone involved.